We are counted amongst as the foremost provider of Mini Tablet Press Machine II. Under the stern vigilance of our dexterous technocrats, this machine is properly manufactured using supreme grade components and ultra-modern techniques. In line with set industry standards, the offered machine is examined on different measures of quality by quality auditors to ensure its high functioning. 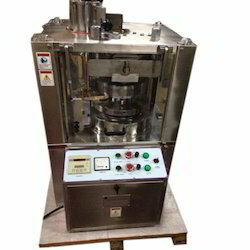 This machine is used in pharmaceutical industry for sizing and shaping up the tablets. Available in “B” & “D” Tooling in both models. Turret Speed up to 40 RPM. AC inverter Drive for main motor. Operator safety through upper guard interlocking. Looking for Mini Tablet Press Machine II ?